Scientists at the Pacific Northwest National Laboratory (PNNL) recently had a eureka moment, when they accidentally invented an unusual material that can harvest water from the atmosphere. According to the researchers, these carbon nanorods absorb and release water in a completely different, somewhat baffling way. Our unusual material behaves a bit like a sponge; it wrings itself out halfway before it’s fully saturated with water. The breakthrough, the scientists believe, could pave the way for efficient, low-energy water-harvesting systems as well as smart fabrics that automatically expel excess sweat from the wearer’s body. As Lao goes on the explain, the team stumbled upon the new material by accident while trying to build magnetic nanowires. It was during their research on magnetic nanowires that the scientists ended up creating a special type of carbon nanotube. When examined with the help of a specialized vapor analysis instrument, the nanorods seemed to lose some of their weight with increase in the ambient humidity. Believing that the observations were the result of a faulty instrument, the team analyzed the new material once again using an incredibly accurate, high-powered microscope. The bizarre phenomenon, according to the researchers, was originally suggested back in the 1990s. As part of their current research, the team came across two papers, dated 2012 and 2013 respectively, which revealed that water or any other liquid can spontaneously evaporate when confined to a space less than 1.5 nanometers in width. The same thing, the papers state, happens if the liquid is lined with hydrophobic (i.e. water-repelling) substances. 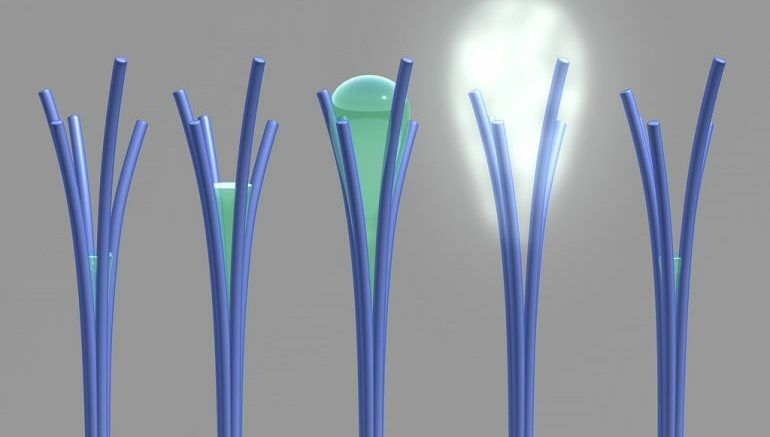 As the scientists explicate, the unexpected phenomenon takes place when water condenses and forms a bridge between the carbon nanorods via a process known as capillary condensation. The liquid present between the rods in turn causes surface tension, bringing the adjacent tubes closer to each other. When the gap between them decrease to about 1.5 nanometers, the water spontaneously vaporizes. Now that we’ve gotten over the initial shock of this unforeseen behavior, we’re imagining the many ways it could be harnessed to improve the quality of our lives. But before we can put these nanorods to good use, we need to be able to control and perfect their size and shape.